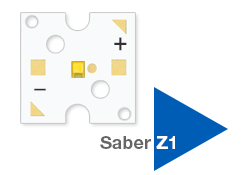 At 5mm square, the Saber Micro-Z1 is the smallest LED module that we currently offer. The module features a single LUXEON Z LED soldered to an aluminum MCPCB. Extremely small footprint that can be worked with standard bench top tools. Compatible with virtually any LUXEON Z compliant secondary optic. Available in all colors, including a selection of UV wavelengths. 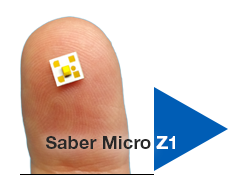 Order the Saber Micro-Z1 online now! 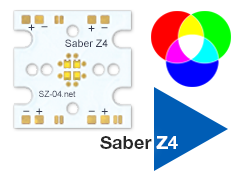 The Saber Z1 features a single LUXEON Z LED soldered to an aluminum MCPCB. Offers both easy handling and a small size that can be worked with standard bench top tools. Compatible with a wide range of secondary optics. Order the Saber Z1 online now! 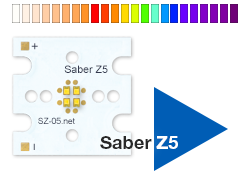 The Saber Z5 features 4 series connected LUXEON Z LEDs soldered to an aluminum MCPCB. Can produce up to 4 times the lumens output as a single Rebel LED from a 2.6mm square emitting area. Order the Saber Z5 online now! Choose any combination of Colors, Whites or UV LUXEON Z LEDs soldered to a 20mm square aluminum MCPCB. Small, tightly configured emitting array of 4 LUXEON Z LEDs provides flawless color mixing. Can be configured so that LEDs are powered in parallel for individual control, or serial to light all LEDs from a single driver. Order the Saber Z4 online now!